Campbell American Custom Burled Walnut UK-1 – SOLD! Connections are the very heart of the music industry. There are all sorts of connections that help us do what we do. From 1/4 “ connection to SPDIF connections to Firewire, they all are integral to the way we make music. There are other connections that are more human and involve a sight, touch, smell and sound. From the first phone call that I took from Dean Campbell, we had a connection, as we are both no-nonsense, brutally truthful to a fault and proud fathers to some very cool kids. Dean’s guitars are about a human connection. They are built one by one and with a whole lot of love and mojo thrown in for good measure. Campbell American Transitone – SOLD! I have a very clear memory of the first time I held a Campbell American guitar in my hands. 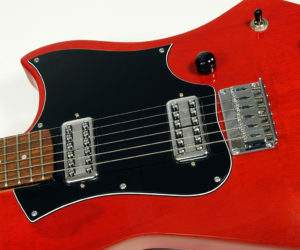 It was a double cutaway solid body with a flat black finish and a bolt-on maple neck. For such a basic design, it looked surprisingly cool. There was something very elegant about the simplicity of it all. Then I played it, and all thoughts of “simplicity” got burned away. The guitar played like an absolute dream. The neck was beautifully carved. The fretwork was impeccable. The body was lightweight and well contoured. The hardware and electronics were all top notch. Never before had I played a guitar that relied so little on flashy looks, yet was able to completely blow me away. Campbell American Precix – SOLD! 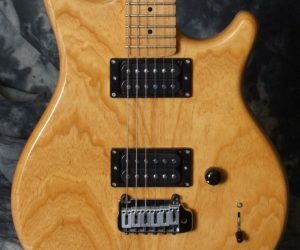 It isn’t often that a guitarist gets to be given a “Carte Blanche” on design and building a guitar. This is exactly what happened in the case on this fine specimen…after Dean won the Floyd Rose debate. Owner Dean Campbell and I went back and forth until we came up with this winning combination of features and aesthetics.